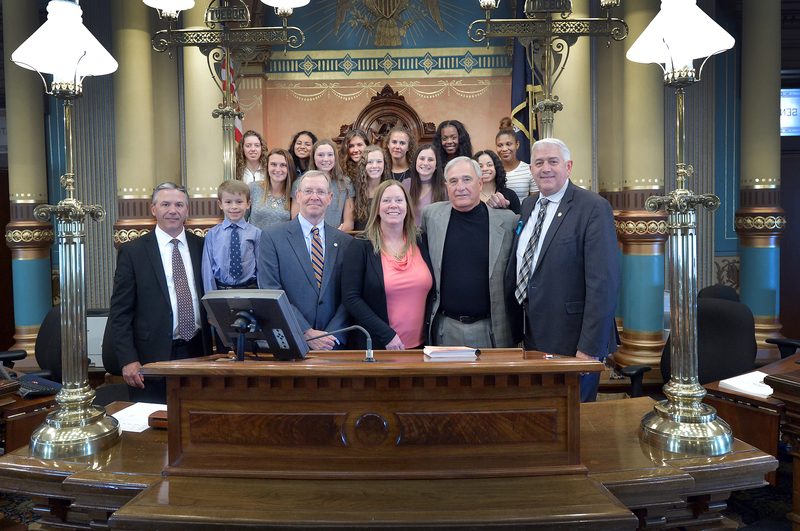 LANSING, Mich. — State Sen. Ken Horn, R-Frankenmuth, welcomed the players and coaching staff of the Saginaw Heritage High School girls basketball team to the Michigan Capitol on Thursday to recognize their recent Class A state championship title. Horn was joined on the Senate floor by the players, Head Coach Vonnie DeLong, Assistant Coach Bill DeLong and Saginaw Community Schools Superintendent Doug Trombley as he presented the team and coaching staff with a special tribute honoring their accomplishment. The Lady Hawks beat East Lansing to claim the state title on March 17, earning their second state championship in the school’s history. PHOTO CAPTION: State Sen. Ken Horn, R-Frankenmuth, stands at the Senate rostrum with state Rep. Tim Kelly, R-Saginaw Township, the Saginaw Heritage Lady Hawks, Head Coach Vonnie DeLong, Assistant Coach Bill DeLong and Saginaw Community Schools Superintendent Doug Trombley on Thursday after the team and coaching staff were presented a special tribute honoring their recent Class A state championship.